The term ‘frontispiece’ emerged into the English language around the start of the 17th century. In an increasingly saturated book market, publishers had to make editions more attractive to the buying public. ‘Front matter’, of which frontispieces are a part, was a way of advertising and framing the content of the text that followed. There can be no doubt as to the topic of this book. Jesus stands within an architectural framework, in the doorway of the book so to speak, inviting the reader inside. The Imitation of Christ, by German priest Thomas à Kempis (1380-1471), is one of the most widely read Christian texts in history; it has gone through hundreds of editions. This particular volume was printed by John Hayes, Cambridge University Printer, in 1685. 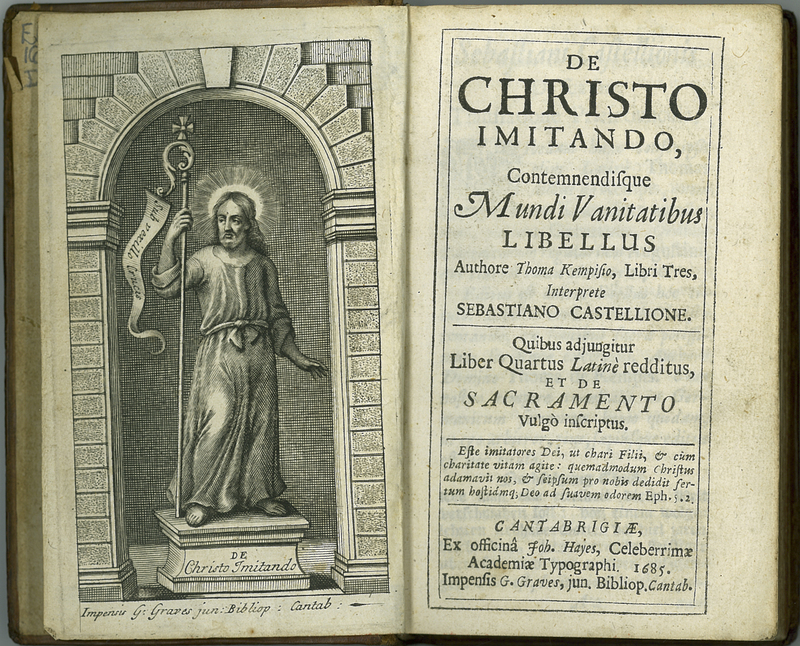 [Thomas à Kempis], “De Christo Imitando: Contemnendisque Mundi Vanitatibus Libellus,” ourheritage.ac.nz | OUR Heritage, accessed April 20, 2019, http://ourheritage.ac.nz/items/show/10670.